Ever wanted to unearth a dinosaur? They are ready, packaged and waiting for you. On a remote plateau deep in the Queensland outback, a sound like a dentist's drill reverberates inside a shed. A goanna struts past an open door and half a dozen faces peer intently through magnifying lenses as their tools whirr at bone and rock. Nobody here is a dentist. They are museum visitors and they are, in effect, making dinosaurs. The shed is the working centrepiece for the Australian Age of Dinosaurs museum, outside of Winton. 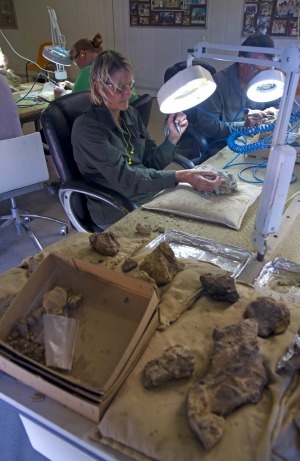 The largest and most productive fossil preparation laboratory in the southern hemisphere, its output relies on these visitors, here to work as volunteer palaeontologists in the museum's Prep A Dino program. "If we didn't have this program running on a daily basis we wouldn't be able to meet our targets for the museum," says laboratory operations manager Trish Sloan. "We've got about 15 to 20 years' of work sitting in storage here." The Australian Age of Dinosaurs sits at the heart of a region that palaeontologists have dubbed the "Dinosaur Triangle". Half a century after dinosaur bones were discovered in the area, dinosaur tourism has assumed T-Rex-sized proportions in this part of western Queensland. In Winton, dinosaurs have usurped even Waltzing Matilda as the town's greatest tourist attraction. "People used to come to go to the Waltzing Matilda Centre," says mayor Butch Lenton. "Now they go to the centre because they're here, but they're here for the dinosaurs." There are dinosaur attractions throughout the region - nearby Richmond and Hughenden have museums of their own - but the Triangle's undoubted apex is the Australian Age of Dinosaurs. Perched atop a Jump-Up, or mesa, with views across the outback plain to Winton, 20 kilometres to the northwest, the museum has the world's largest collection of Australian dinosaur fossils. Inside are the skeletons of three major dinosaurs - Elliot, Matilda and Banjo. Owner David Elliott stumbled across Elliot's thighbone while mustering sheep in 1999 on his nearby Belmont property. It turned out to be Australia's biggest dinosaur and the find that led to the creation of the museum. Matilda and Banjo were discovered together, leading palaeontologists to believe that the larger sauropod Matilda killed Banjo - the most complete carnivorous dinosaur skeleton found in Australia - when attacked. Visitors can simply tour the museum, but the richer experience is the Prep A Dino program in the adjacent laboratory. Here visitors can sign on to prep bones for a day, or stay for 10 days to become an honorary technician, granting them the right to work for free in the lab whenever they choose. "We've had one guy come for 10 days and he ended up staying for eight months," Trish says. When I arrive at 9am to begin my day of work, the lab is already buzzing with dentist-like sounds. Fossils in plaster jackets line one wall, waiting to be unearthed, and tour groups are being guided through its operation. I take my place at my workstation, fit my safety glasses and begin the job of releasing a dinosaur from its 100-million-year-old carapace of rock. I'm working on a rock the size of my two fists together. My tool is like a tiny jackhammer, used to chip away slivers of rock until I reach fossilised bone. As the hours tick away the rock slowly shrinks and the exposed areas of bone increase. The work is meticulous, methodical and entirely addictive. By day's end I don't want to leave my dinosaur. "When I first started I used to sit there for eight, 12, 14 hours a day," Trish says. "I think it's the glory of the find. If you unearth a bone you're the first to see it for 100 million years." I'm working on a dinosaur called Wade, an as-yet-unidentified sauropod. Wade was found on Belmont station in 2005 and is the most complete sauropod skeleton ever unearthed in Australia. About 60 per cent of Wade's bones were found - a good find is generally considered to be anything more than 25 per cent of the skeleton. My tiny piece of Wade is one of the last bones in this particular dinosaur jigsaw, with the project nearing the end of the found specimens. One day soon, Wade will sit in a museum, probably this one, and I'll know that I helped carve him out of the earth. 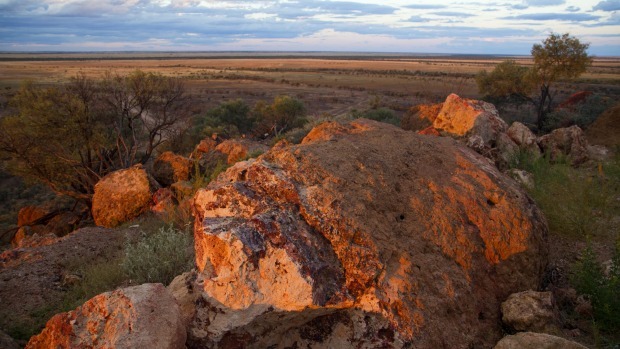 About 100 kilometres south-west of the Australian Age of Dinosaurs, there are other rocks that hold Winton's second great prehistoric treasure. At Lark Quarry Dinosaur Trackways, dinosaur footprints are the star feature. Set in a stunning landscape of rust-red hills dotted with spinifex, Lark Quarry is the site of the world's only known dinosaur stampede. Across its bedrock, which was once a muddy spit on a lake, the footprints of at least 150 dinosaurs tell the story of a huge theropod charging a crowd of chicken-sized coelurosaurs and larger ornithopods as they drank from the lake. It's a 95-million-year-old moment frozen in time. Fast-forward to 1960 and Glen Seymour, the manager on the surrounding Cork station, was searching at the base of a hill for opals. Instead he uncovered footprints. "He thought he'd picked up bird prints because in 1960 Australia didn't even know it had dinosaurs," says Lark Quarry guide Bill Wilkinson. "Now we can't move for them out here. They're everywhere." The Dinosaur Trackways are protected inside a rammed earth and steel building set between hills. Admission is only by guided tour, and we enter through a room lined with shelves of fossilised footprints. "These are the ones they threw out after the excavations," Bill says. "They had too many footprints." He points at one print showing twisted toes. "This dinosaur might have fallen down and been trampled in the stampede." Inside the main room the surface of a large rock slab is scratched and scrawled with the bird-like prints of the small coelurosaurs. A wooden boardwalk runs along one side of the rock, allowing visitors to look down onto the larger prints of the theropod. The attacker's 50-centimetre-long footprints are about 10 times the size of those of the coelurosaurs, creating a sense of menace that lingers even millions of years on. Look carefully and you can even see the spot where the theropod changed its gait to begin its attack. The rush of dinosaurs back past the theropod left an abstract canvas of prints in the rock - feet sliding and skidding in panic, mud pushing out from between their toes - and a unique moment in prehistoric records. 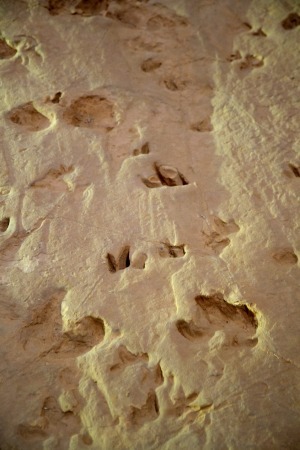 Lark Quarry is the only site in the world where dinosaurs have left record of running, and these very footprints were used as the blueprint for stampede scenes in Jurassic Park. As I drive out from Lark Quarry, I stop on a rise and look back over the site. The building has disappeared within the folds of the red hills, termite mounds angle out of the earth and rust-coloured escarpments gape like wounds. It's a land that looks suitably timeless, even confronting, as grey storms march across the sky, dumping sheets of rain across the outback plains. Here there be monsters. The writer travelled courtesy of Tourism and Events Queensland. Qantas flies daily to Longreach, which is 180 kilometres south-east of Winton. By road, Winton is about 1350 kilometres north-west of Brisbane with connections from Melbourne and Sydney. A vehicle will be required to reach the Australian Age of Dinosaurs and Lark Quarry Dinosaur Trackways. Hire cars are available at Longreach airport. See qantas.com.au. For a brush with history and legend, stay in the recently renovated rooms at Winton's art deco North Gregory Hotel. It was at this hotel that Waltzing Matilda was first performed in 1895. Rooms start at $100. See northgregoryhotel.com. Prep a Dino volunteers pay from $87 for a single day through to $582 for the 10-day honorary technician assessment. For details, see australianageofdinosaurs.com. A tour at Lark Quarry Dinosaur Trackways costs $12. See dinosaurtrackways.com.au. Muttaburra (Queensland) Visit the western Queensland town where the first dinosaur discovery - Muttaburrasaurus - was made in 1963. The town has plans to build a Muttaburrasaurus museum. Naracoorte Caves (South Australia) A trove of fossils from ancient animals that fell into these World Heritage-listed caves - think megafauna such as the marsupial lion and the giant wombat Zygomaturus trilobus. Kronosaurus Korner (Queensland) Richmond's addition to the Dinosaur Triangle, a museum featuring a great collection of marine fossils. Broome (Western Australia) Head to Gantheaume Point at low tide to see a range of dinosaur footprints. National Dinosaur Museum (ACT) Museum housing 23 complete skeletons and a host of individual fossil displays.